Tina & The Duke — Love at first bike! I never knew biking could be so fun and freeing until I met The Duke at a local bike shop. Empowered with $500 through a college student bike loan program, my boyfriend and I picked out my beauty and brought him home last week. Since my boyfriend’s bike is named Beatrix, I had to find a manly name for my little darling. So, I dubbed him The Duke. I’ve never spent much time on a bike. As a kid, I was only given a cheap girl’s single-speed bike. And then I was only allowed to use it in the driveway, because we lived in the Texas Hill Country and my mom didn’t want me on the county roads competing with big ol’ trucks and what have you. Whatever. The point is that I didn’t learn how to ride a bike very well, and then I had an off-putting experience biking around Lubbock where I currently live. 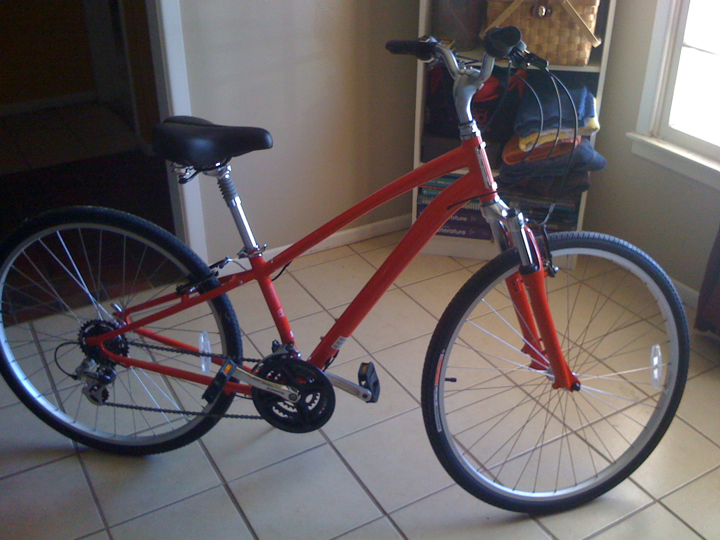 A kind friend gave me a hand-me-down bike, but it was the garden variety (cheapie Wal-mart) kind. I huffed and puffed and rarely went more than a few blocks before whining about wanting to come home. It was super difficult to ride. My boyfriend gave me a hard time about it until he had a go and realized it wasn’t just me. The bike sucked. But The Duke? Oh, Lordy! I could ride him… well, a long time. Probably not all day. My bum is still a little sore and not accustomed to daily biking yet. For one of our first trips together, I took him to Rosa’s for some Mexican food. It’s only a few minutes away by car and I figured I would be alright going through neighborhoods to get there. 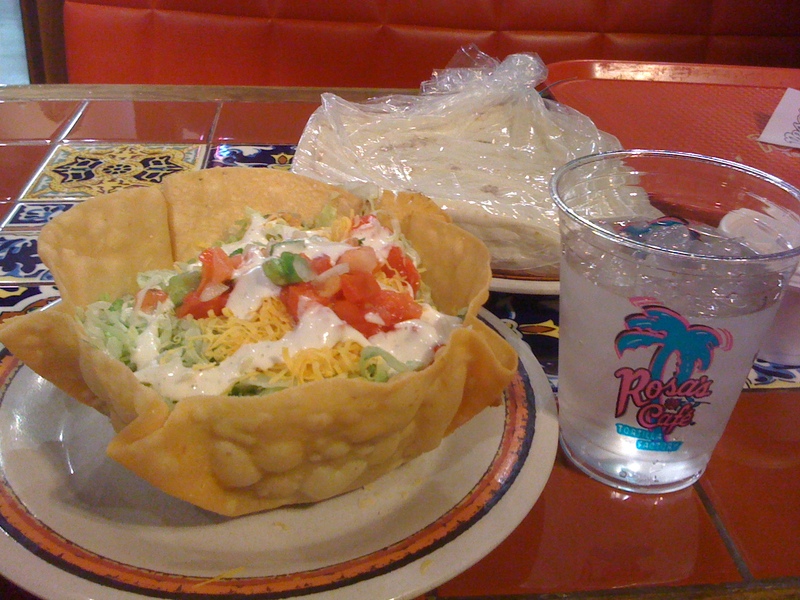 Rosa's taco salad and tortillas with queso. Yum! It was in the late afternoon. So, there wasn’t much traffic getting there or back. The only trouble I had was figuring out how to secure the cup of queso in my shoulder bag for the ride home. Fortunately, I happened to use the shoulder bag that I take on walks with our dog Gaia and found a plastic bag (for unexpected poops) to wrap around the queso in case of spillage. (It was a clean bag from a loaf of bread, no worries.) Everything made it home okay — even the bits of taco salad shell I saved in another baggie for Gaia herself. But the best part about it? I arrived home only slightly winded. Biking around town for various errands and biking to work on days I’m not rushing to be anywhere — totally doable. Oh, Duke. The places we’ll go! You just wait and see. Next We made the paper!